"Paul Hollingshead 1931 " is part of the exhibition on view next week at the Alumni Center. Lunchable is a regular feature of the UC Davis Arts Blog suggesting exhibitions and attractions that can be viewed during a lunch or other short break. “The Art and Heart of Being an Aggie” will include photos from the early- to mid-20th century by Bill Hollingshead’s father, Paul W. Hollingshead, and paintings by Sharon Hollingshead. Paul Hollingshead studied at the New York Institute of Photography, worked for Edward Steichen, and did fashion and movie star photos for Vogue and Vanity Fair. After returning to California, he ran a Woodland photo studio from 1932 to 1962. The exhibition will also include photo stories on the life of Bill and Sharon Hollingshead, social and civic groups in the area, parades and other public events from the past, and the California Aggie Marching Band, of which Bill Hollingshead was a member. It will be on display from Sept. 6 to Nov. 2. 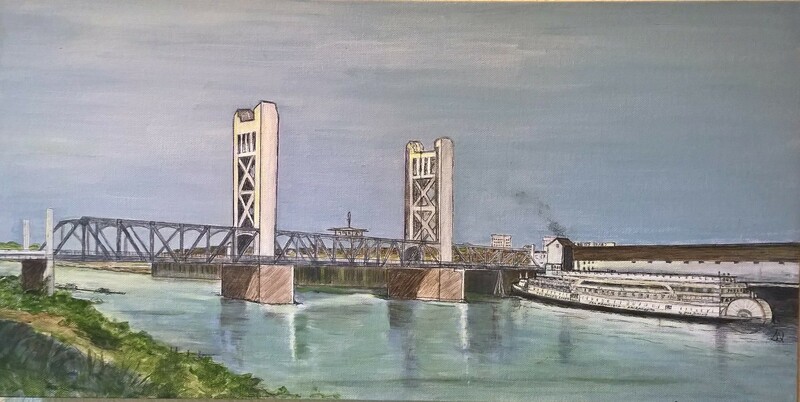 "Tower Bridge" is a painting on display next week in "The Heart and Art of Being an Aggie." “A Salute to All Our Veterans” celebrates the anniversary of the end of World War I on Nov. 11, 1918. This exhibition will include historic photos from the UC Davis Library documenting the contributions of the UC Farm (which would become UC Davis) to the war effort through agricultural education and farming technological developments, along with historical photos by Paul Hollingshead taken at Camp Kearney, California, and Paul Hollingshead’s Army uniform. The exhibition runs Sept. 6 to Nov. 30. An opening reception take place Sept. 7 from 4 to 7 p.m.
Additional photos and information here.